I’ve been meaning to prepare this post for quite some time now, so I am excited to share with you all the highlights from the wonderful city of Toulouse! Known as ‘La Ville Rose’, or the Pink City, Toulouse is made of ochre rooftops and buildings tinted in pink and earthy tones. I’ve made a list of the best things you can do in Toulouse, so, if you’re getting ready to visit, don’t go before we tell you what you can’t miss! Toulouse is one of the most important towns in the southwest of France. A modern city that retains many of its ties to the past, it provides the perfect blend between modern and traditional making it one of the most rewarding and beautiful tourist destinations in this part of the France. Explore Toulouse's most famous attractions like Basilica of Saint-Sernin and Church of the Jacobins. Along the way, you will visit some of Toulouse's lovely squares where you can sit and relax with a good cup of coffee. This two days itinerary has it all organized in the most convenient and short route. 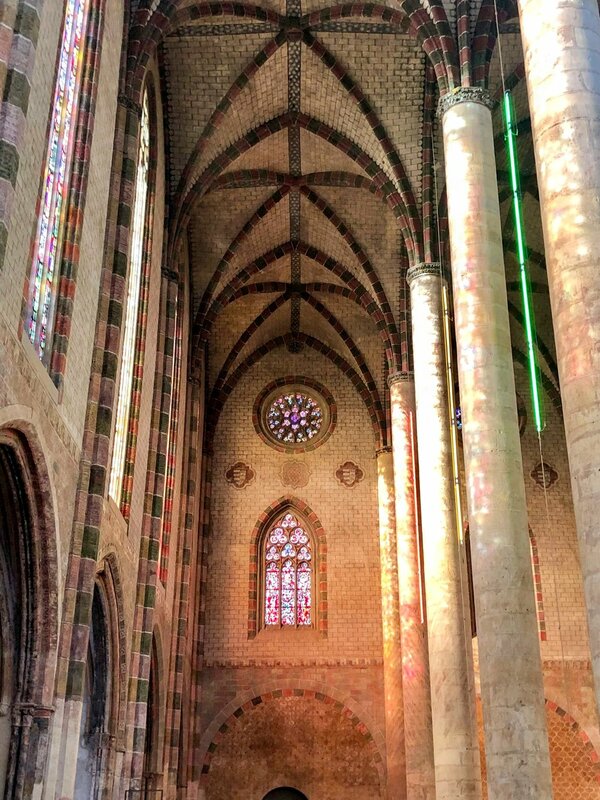 The Basilique Saint-Sernin is a masterpiece of Romanesque art and if you’re truly passionate about architecture, you have to make sure you visit it from both the outside and the inside. This building is unique because it’s been rebuilt throughout the years, so it has absorbed a little bit of every architectural style. The inside is as impressive as the outside but we have a feeling that you’ll be awestruck when you go in. Bonus! 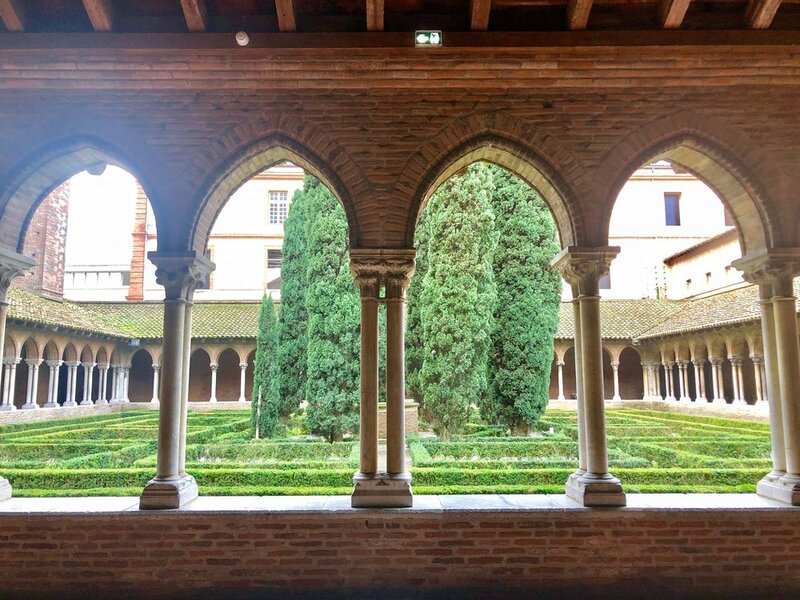 Basilica of Saint-Sernin is part of Toulouse historical walking tour. The Capitole is the city hall and the heart of the municipal administration of Toulouse. This elegant building is located in a beautiful square - the Place du Capitole - one of the most popular areas in the city. The square is full of cafés and restaurants, where you can try local delicacies and there usually is a flea market going on, where you can buy books and vintage objects. If you have time, visit the Capitole itself and be amazed by its architecture and décor. Since we visited during the Christmas holiday, there was a beautiful and quite large Market right on the footsteps of the Capitole. The Couvent des Jacobins was by far one of the most special places we visited during this trip. I loved it so much. The ‘Jacobins’ is a Dominican monastery dating all the way back to 1229 and is a unique example of southern gothic design.You won’t see many places like this in your life: its mysterious, almost ominous look will attract you like a magnet, even if you weren’t planning on visiting. This medieval convent is a must-see, regardless of how religious you are. You won’t regret it. Take a moment to admire the sun rays going through the stained-glass windows of the convent. Just incredible. Foundation Bemberg is a private museum that showcases a permanent collection of paintings, bronzes, and art objects from the Renaissance and the Modern French School. If you’re interested in art, this place needs to be part of your itinerary: after all, one of the best ways to understand a country’s culture is through its art and this museum has plenty of artworks created by French artists. he bridge took nine decades to complete and it was opened to traffic in 1632 by Louis XIV. You can cross the bridge on foot via pavements, bicycle through it on the bicycle path, or enjoy a boat ride across the waterway underneath it. I also recommend enjoying breakfast at Cafe le Cerise. Toulouse can be seen as a city rich in history and historical landmarks. But all its museums, places of worship, and important buildings are not only what makes it special. All the canals with stunning walks by the river make it even more romantic and add a strange feeling to it, the feeling that you may have been thrown into a movie set. The city has an obvious kind of beauty but a less noticeable charm. When you visit it, allow yourself to be guided by the city itself into its extraordinary past and you will understand, too, how special it is. Tell me in the comments what your favorite spot is in Toulouse!